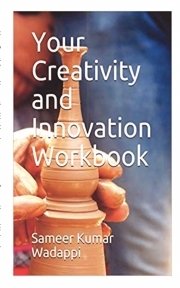 Description of "Your creativity and Innovation workbook"
Need a creative push! and guide on how to be creative and solve problems. This work book is designed to enable you to tap your creative talent. It provides content for you to learn and practice creativity and innovation through exercises and quizzes. The Book guides you with the help of 6 well known techniques to create ideas that will boost your effort to solve problems. Several unconventional sources of creativity and innovation are explained to trigger alternative thought process. Finally a real world hands on exercise related to air pollution problem is provided with sample solutions. This book should help you realise personal / professional goals. Mr. Sameer Kumar Wadappi: Sameer is skilled in patent/scientific information analysis, creativity/innovation methodologies, plant engineering. He has trained and mentored patent information teams to build world class patent informatics organization. He has 15+ years’ experience in creativity, innovation, patent research & analysis and engineering. Sameer worked with multinational companies such as Creax, Procter & Gamble in various roles such as innovation engineer, patent information scientist and plant process engineer. Recently he started his own venture Innokrish Consulting Services. Sameer enjoys connecting dots to solve problems. Reviews of "Your creativity and Innovation workbook"